Streetwise Automotive has undergone major investment in MOT testing facilities including the latest in automated test lane technology. This gives us the competitive edge with MOT testing and allows our fully qualified MOT testers to carry out your test in the best environment possible. Streetwise is an officially appointed VOSA MOT test station, we are governed and regulated by the Vehicle Operator Services Agency and operate in full compliance with their procedure and guidelines. Please contact us now to arrange an appointment. M ost modern vehicles come equipped with air conditioning or climate control systems. These systems rely on compressed refrigerant gasses which can escape from the system over time. Major motor manufactures have been quoted as saying that up to 10% of the gas can be lost each year. Any significant loss of gas will result in reduced performance of the system. It is therefore recommended that your air con system is recharged and re-lubricated every two years, and more frequently for high mileage cars with climate control that is always on. Streetwise automotive offers a complete air conditioning re gas and lubrication service that utilises the latest equipment and technology. We can also check for faults and leaks within the system as well as apply a chemical to remove the bacterial build up in your air con system. Streetwise Automotive is home to the latest in computer controlled four wheel alignment equipment. Most modern vehicles come with very specific tolerances of wheel alignment which will have an effect on how your car handles, grips and wears its tyres. Most cars have their alignment set correctly in the factory but it’s very common for alignment to get knocked out of place due to pot holes, poor quality roads and contact with curbs when parking. Most garages and tyre fitters will offer a very basic tracking service which will measure and re set just one aspect of the front wheels. This alone is not enough to guarantee correct wheel alignment. Out of date and well used equipment will also lead to incorrect wheel alignment. 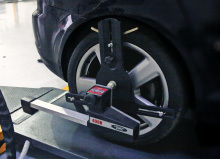 Our Supertracker 4-Wheel Alignment Computer guarantees the correct alignment of all four wheel across each plane of movement. This will result in better handling, reduced tyre and suspension wear and better grip. A four wheel alignment is also essential for any car that has undergone suspension lowering or modifications. If your vehicle has had major remedial work on it’s suspension then a four wheel alignment is also essential.